When discussing the jet aircraft that emerged at the end of World War II, most recall the early jet fighters of Germany and Britain, possibly with note to the USAAF's early P-59s and P-80s. However, the US Navy was quite active in the early development of jet aircraft. As early as December 1942, the Navy had proposed jet-powered fighters. By September 1945, the Navy had several types of jets entering service, reaching final design phases, or being refined. Theoretically had the war continued into 1946, several Navy jet types would have seen combat over Japan. The Navy faced three main problems while adapting jet aircraft to the flight deck. First, the jets had longer take off runs. Second, the early jet engines were not very fuel-efficient; requiring more space dedicated to aviation fuel on board the carrier. Lastly, the jets had very high landing speeds. The Navy solved the first problem with stronger steam catapults, and ultimately revised deck layouts. As engine development progressed, more fuel-efficient engines with greater power arrived, alleviating the second problem somewhat (but this still retarded development of jet bombers for the Navy until the 1950s). The high landing speeds meant future naval aircraft would need tricycle landing gear. In addition, the carriers needed better landing aids and arresting gear. All of these developments would come in time, but in 1942, clearly the safe bet was still the piston engine monoplane and would be for some time. However, working within the limitations placed upon jet design due to the, at the time, unresolved problems, the navy issued a requirement for a composite powered (piston and jet engine) fighter in late 1942. Of the nine manufacturers invited, only one managed to win Navy approval. Ryan Aeronautical Corporation began development of the XFR-1 Fireball in February 1943. A Wright R-1820-72W generating 1425 hp for take off was the main engine. A 1,600 pound thrust GE I-16 was fitted in the tail, with intakes at the wing roots. The XFR-1 first flew on June 25, 1944. The top speed using the piston engine was a meager 295 mph, with jet engaged it topped 404 mph. Clearly the Fireball offered few advantages over the F4U types already in use. Still production started in January 1945, with 66 delivered before VJ-day cancelled further production (total orders exceeded 1200 examples). Those delivered served first with VF-66 at San Diego starting in March 1945. The design featured folding wings and tricycle landing gear. Armament was 4 0.50 caliber machine guns, and wing points for two 1000 lb bombs, two drop tanks, or four 5 inch rockets. After trials on the USS Ranger (CV-4), the squadron was reorganized as VF-41 (and still later VF-1E) in October 1945. Further trials were conducted on the USS Wake Island (CVE-65), USS Bairoko (CVE-115) and USS Badoeng Strait (CVE-116). Fatal crashes and concerns over safety caused the Navy to reduce operations of the FR-1. By July 1947 the type was removed from service. Ryan proposed several modifications to the powerplant to improve performance, these designated the XFR-2, 3, and 4. The XFR-4 added a 4,200 pound thrust Westinghouse J34 engine, but the Navy was just not interested. One FR-1 was modified with a 1,700 hp G.E. XT31 turbo-prop engine boosting speed to over 500 mph. The XF2R-1, as it was designated, flew in November 1946, but failed to receive the Navy's production orders. A contemporary of the FR-1 was the last Curtiss fighter design for the Navy -- the XF15C-1. With a Pratt & Whitney R-2800-34W (2100 hp) and a De Havilland Halford jet (2700 pound thrust), the XF15C was also a composite design. Four 20 mm cannon and two 1000 lb bombs armed the Curtiss fighter. Its first flight, on February 28, 1945, was on piston engine only. Only in May were tests with the jet engine installed conducted, and even then delayed by a crash. The two remaining prototypes were fitted with a T-tail afterwards, but still only reached 469 mph with both engines (432 on piston engine only). Curtiss's last fighter for the Navy was not suitable for post-war Navy needs. 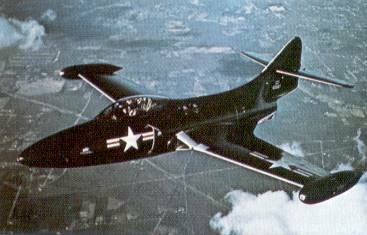 The first pure jet fighter designed specifically for Navy use was the McDonnell XFH-1 (at first designated the FD-1). With two Westinghouse J30 engines, the Phantom, as McDonnell named their first Navy fighter, could reach 479 mph. Fuel economy was a factor, since the hungry J30 engines reduced normal range to only 695 miles. The Phantom carried four 0.50 cal machine guns. The FH-1 first took to the air in January 1945, winning a production contract the following March. Only sixty were produced due to post-war cutbacks, but these served in VF-17A (later VF-171) and VMF-122. Phantoms made the first take-off and landing from a US carrier in July 1946 from the USS Franklin D. Roosevelt. But their front line service was short. In September 1944, the Navy requested follow on designs for jet fighters. Grumman, North American and Vought all responded. Grumman, at the time involved with F7F and F8F final development, deferred its offering, which was later revised into the F9F Panther. North American used many aerodynamic features from the P-51 Mustang to form the jet powered XFJ-1 Fury. The Fury had straight wings, tricycle landing gear, and six machine guns. Developed concurrently with the USAAF's XF-86, the Fury first flew in September 1946 with Allison J35 (3820 pound thrust) jets. The FJ-1 reached 542 mph in level flight, but with only an 858 mile range. While it was the fastest naval fighter of its time, production was limited to only 30 examples. Later refinements with the USAF F-86 produced a swept wing design that defeated the MiGs over Korea. The Fury would return to carrier flight decks as the FJ-2, a navalized version of the swept wing F-86. Vought's XF6U-1 Pirate was a straight wing design built around the Westinghouse J34 (3000 pound thrust). As with the North American design, the Pirate's development was curtailed after VE-Day, and first flew in October 1946. Armament centered on four 20mm cannon. The F6U utilized a bonded wood-aluminum construction to save weight. Still aerodynamic shortfalls reduced top speed to 535 mph with a 783 mile range. After a prolonged development, only thirty were accepted, these not reaching fleet service. Realizing even early in 1945 while the planes were in mock-up that the Phantom, Fury and Pirate were not matching USAAF or foreign types, the Navy began issuing new requirements. The Navy placed orders for prototypes of McDonnell's refined F2H Banshee and Grumman's F9F Panther before the end of the war, both offering higher performance. The further development and service of these types fall outside the scope of this article, as while technically World War II designs they were for all practical purposes post-war types. Clearly the US Navy was heavily involved with jet fighter design by VJ-day, even though performance levels of the types was behind other contemporary designs. One must remember though the Navy not only had to develop a plane to accept the new jet, it also had to refine its aircraft carriers to handle those new jets! Robert F. Dorr. "P-80 Shooting Star Variants." Wings of Fame. Volume 11. Westport, CT: AIRtime Publishing, 1998. William Green and Roy Cross. The Jet Aircraft of the World. Garden City, NY: Hanover House, 1956. Ray Wagner. American Combat Planes, Third Edition. Garden City, NY: Doubleday & Company, Inc. 1982. Gordon Swanborough and Peter M. Bowers. United States Navy Aircraft since 1911. Annapolis, MD: Naval Institute Press, 1990.